Save Rs300 (30.03%) – Earn 0 points What is Landmark Rewards? Landmark Rewards is the Landmark Group’s loyalty programme, which allows you to earn points when you shop any of our brands. GINGER presents to you this pair of sneakers which will be an ideal choice for any fashion conscious person. The perforations all-over makes it look stylish while the round toe adds to its design. 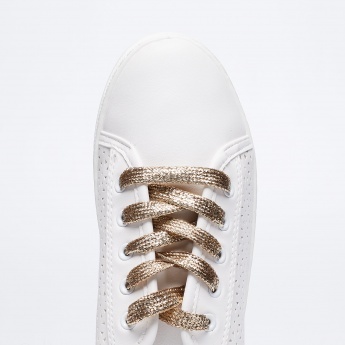 It also features a shimmery lace-up fastening that makes it a party wear.